This dish is so earthy and delicious. The thyme is fabulous with the corn, mushrooms, and kale. All of the colors and textures look and taste so beautiful. It is sure to impress your guests! Gluten-free: Use gluten-free gnocchi or a different gluten-free pasta. 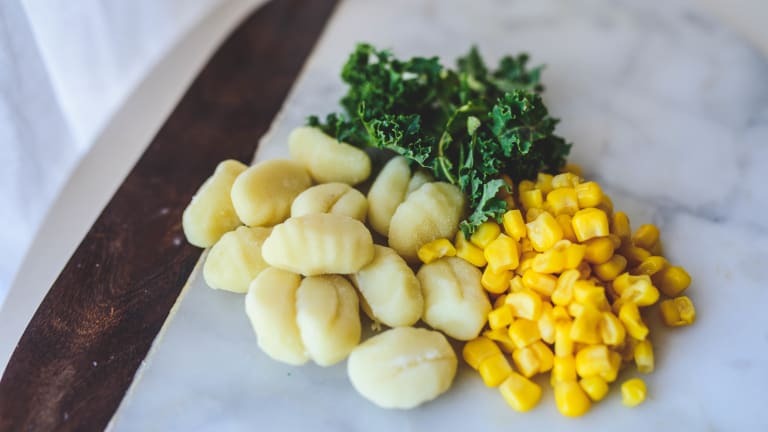 Paleo: Use Paleo-friendly gnocchi; replace corn with diced bell peppers; replace butter with ghee; omit Parmesan cheese. 1. Heat a large pot of water to boil on high. 2. In a large nonstick skillet, heat about 1 Tbsp of olive oil over medium heat until hot. Add the mushrooms, onions, and a little salt and pepper, and cook 4-5 minutes or until soft and browned. 3. Add the butter to the pan and cook, stirring occasionally for about 2-3 minutes or until golden brown and fragrant (watch it, though, because you don’t want the butter to burn). 4. Add the kale, corn, and thyme and season with salt and pepper. Cook about 5-6 minutes, stirring occasionally, until kale is wilted. 5. While the vegetables are cooking, add the gnocchi to the boiling water and cook according to package instructions. Reserve 1 cup of the gnocchi cooking water and then drain the gnocchi. 6. Add the gnocchi to the pan with the vegetables. Add about ¼-⅓ cup of the reserved cooking water and stir to coat the gnocchi. Gradually add more water to coat the pasta well (you don’t want it to be dry, but also not soupy—it should just help coat the pasta with the butter and other flavors). 7. Remove from the heat and season with more salt and pepper, if desired. Sprinkle with Parmesan cheese for serving.